Hey, hey, hey, Scotty Hockey here to keep things shrouded in darkness as TDR wanders the hallowed Hall of Fame in Toronto. Hopefully he is taking everything in and getting his picture taken with the Stanley Cup because the way things look, that will be the closest a Ranger will get to the chalice this season. The Rangers brought their dads with them to Boston and played one of their sloppiest games in recent memory, losing 4-3 in a shootout (official recap here, Scotty Hockey live blog here). If it was me playing in Boston with my dad watching, I woulda gotten a smack on the back of my head for every one of the gaffes. Hopefully Marek Malik's father doesn't believe in sparing the whip because the human pylon was atrocious in taking bad penalties, making ill-advised pass attempts and missing his coverage assignments throughout the game. Should he play in the second game of the home-and-home then the Garden crowd will likely burn him in effigy. 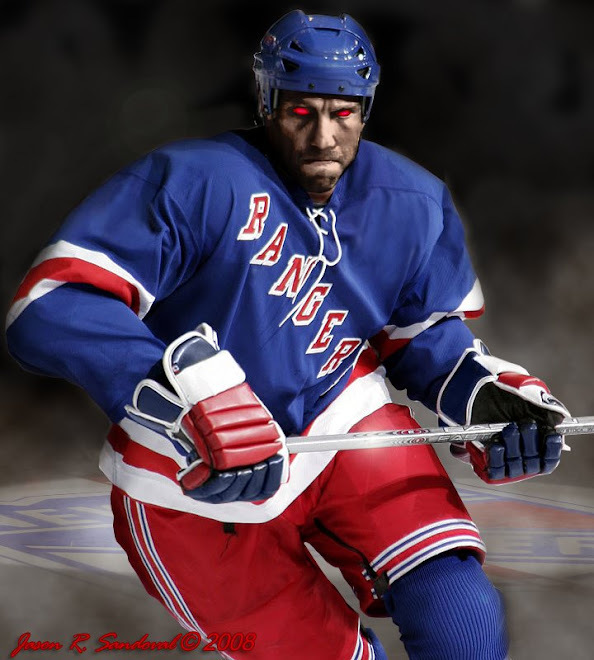 However, Malik wasn't the only Ranger to take a bad penalty, Boston had eight power plays and capitalized on two of them. Chuck Kobasew tied the game at three with his second goal of the game after one of those ill-advised Ranger penalties - a interference call on Paul Mara. Mara had a rough game, trying to make big plays and big hits to impress his hometown crowd. While our loyal captain, Jaromir Jagr, has been plagued by stupid penalties all season long, his minor was a bad call late in the game (although he was partially at fault if you ask me). Luckily Boston did not score on it. Jagr did score a goal in the game, his 14th of the year. It was a true beauty and hearkened back to the days when he was the best player in the league. Despite the incredulous decision to have a father's day trip weeks after Henrik Lundqvist's dad nearly died, the King's psyche held tough and he made one of his best performances of the year. He did give up both goals in the shootout which would be cause for concern but the second one came on a shot from Zdeno Chara that a brick wall would have trouble stopping. He can't let it get to him as we will need every spectacular kick save, dive and catch he can import from Sweden if we are to see the Rangers make the playoffs. But first small steps, he will need to win tomorrow if the Rangers are to keep pace in the East. how appropriate Scotty that you would be contributing to the dark-ness of these Rangers. after todays performance and yesterday, it seems we only have each other these days instead of a team. dark, where the hell r you? better be good because scotty is showing you up. at least the team showed up. Scotty covered what appeared to be haneous hockey, Attack Of The 37 Foot Defenseman, Malik seemed back in prime form -- I'll skip that replay on the DVR, but seriously. Thanks Scotty for covering. It must of hurt to live it 'twice blog'. DJ..if you read the previous blog I was in Toronto for family and hockey business. Listen, I want continual coverage on the blog re: Blueshirts....The Team I Love (to sometimes hate). An Olive branch was extended and I took it. Doesn't sound like any team showed up except for Boston this weekend. TDR - you are quite welcome, glad to be of service. 1) Not a good weekend in Ranger land. They should thank God/the schedule makers that the next team up are the Thrashers who got, well Thrashed by the reeling Buffalo Sabres 10-1 the other night! Scotty, great job on the post! I was all set to publish and then I saw yours last minute and said, "OK. Coverage no longer needed." Was this a brutal weekend or what? I am fresh out of adjectives to describe how bad our boys are playing...watched the Sunday replay tonight and am amazed at how poorly as a team they are playing. What must they be thinking? Shanny has been pretty outspoken about how there is no connection and plenty of JAGR trading talk over the last 24 hours. Not worthy of a post, but one of the more credible rumors is a transfer covering his entire salary by Edmonton. THAT might be interesting. Apparently there are two camps in the locker room. The Czechs and the GRITs. West Side (Locker)Story. Shanny & Jagr divided - with the obvious Jagr-lovers in his corner and the Shanny-lovers (Drury, Gomez, Avery) in the other corner. It would be refreshing to see some divide -- one thing is for sure post-season. Jagr and Shanny will NOT be returning which will free up some cap room for the REAL HOSSA. Kidding, but wouldn't that be sweet? Another European. Gggrr...Scotty, you were right.